Before September 11, 2001, few would have thought that a former surface coal mine in Somerset County, Pennsylvania, would one day occupy a place on the nation’s honor roll of iconic places along with Gettysburg and Pearl Harbor. On that Tuesday morning, four commercial airliners were hijacked, with the intent to use them as weapons. Three of those planes reached their intended targets; one did not. At 10:03 am, the fourth airliner crashed into a field, thwarting the hijacker's plan to attack the nation's capital. It came down in that field as a result of the courageous actions of the 40 passengers and crew onboard. This is the story of Flight 93. But how to create a memorial that can tell such a story? Now, during the 10th anniversary year, the opening of the permanent Flight 93 National Memorial begins a new journey to honor their actions. A different kind of memorial has taken shape; it is more than just one memorial feature, but an entire memorial landscape, spread over almost 1,500 acres. Starting at the new entrance located off US Route 30 a two-mile long Approach Road winds through woods and fields that hint at the mining history of the rural Pennsylvania countryside and belies the violence that occurred just over the ridge. At the Ring Road, the drive becomes more formal as you are introduced to the grand scale of the fields, hills, and sky that surround the crash site and then more intimate as you make your way to the final resting place of the passengers and crew. 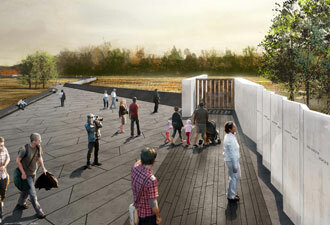 At the end of the drive is a series of formal spaces that serve as the Gateway to the Memorial Plaza itself. Here, through interpretive panels, brochures, and the guidance of the National Park Service rangers and volunteer Ambassadors, you can explore the story in more detail. Beyond this gateway a coal black wall zigzags into the distance, tracing the edge of the crash area itself; intimately close, but ever respectful. The first bend brings you closer to the crash site than the public has ever been permitted before and out in the field beyond, on the edge of a hemlock grove scarred by the violence of that morning, a boulder marks the area of impact. All manner of birds soar on the wing and breezes stir the grasses, flowers, and trees. The stark colors, gray, black, and white, are severe, yet harmonize with the land and allow the earth and sky to provide an ever changing palette of colors. There is serenity, but also an acknowledgment of this as a site of violence. The walk culminates at the white marble walls which indicate the plane's flight path. As part of these walls, forty marble panels stand, polished so one can barely discern where sky begins and marble ends. On each is inscribed the name of a passenger or crew member; the names of mothers, fathers, sons, daughters, wives, husbands, sisters, and brothers. Each panel represents an individual, but together they create a larger element that reminds us that these forty people took action as part of combined and unified effort. Only by standing on the edge of the crash site, or before the names, or surrounded by the grand scope of fields and sky, can one begin to understand the uniqueness of this place. 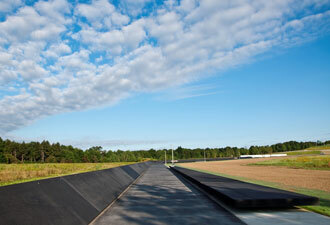 On the evening of September 9, 2011, the temporary Flight 93 Memorial will close for the last time and the next day the permanent memorial will open. 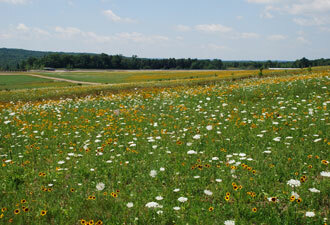 Come experience for yourself a completely new and singular place of commemoration and healing. While this dedication is a milestone, it is only one of three phases of construction. Find out how you can play a part in the next phases.